as when they were younger. Urban Tree Decline is a relatively new term used in arboriculture to describe the syndrome of a slowly dying tree. The cause is abiotic, or environmental. It probably happens to most suburban trees if something else doesn’t kill them first. Urban Tree Decline is caused by an insufficient root system, in turn caused by the hostile environment of the suburban yard – really a terrible place to grow a tree, especially an older tree. A tree with an insufficient root system does not produce enough energy to maintain the canopy, thus the canopy declines. A sparse, unhealthy canopy above the ground usually reflects a sparse, unhealthy root system below; canopy vigor will not return until the root system is improved. When the typical suburban tree grows large enough it essentially becomes a 'container plant.' It is potted and trapped. Roots have restricted latitude and are competing with grass and other plants – competition dramatically more adversarial than widely assumed. 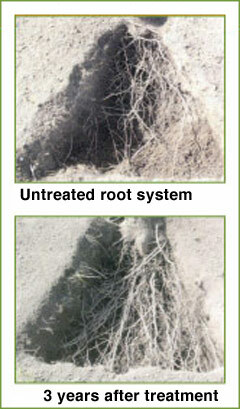 These circumstances are stressful and inhibit root growth and penetration. It is no wonder suburban trees have considerably shorter and unhealthier lives than do their counterparts growing in the forest. Fortunately, much can be done to reinvigorate a tree and make it more tolerant of the stress that causes Urban Tree Decline: "paclobutrazol," the scientific name for a soil-applied growth regulator known by the trade names Cambistat and ShortStop, is an important consideration. Paclobutrazol (Cambistat and ShortStop) reallocates some of the energy meant for the canopy to the root system, simultaneously increasing fine root density and slowing the growth of the canopy by shortening internodal branch growth – a process that alleviates the unhealthy disproportionately between roots and canopy. It creates thicker, greener leaves (with more chlorophyll) and increases resistance to opportunistic insects and fungi. Drought stress causes tremendous damage to trees but paclobutrazol helps retain water. Paclobutrazol is extremely beneficial to the restoration of roots lost to trenching or excavation. (Damage to tree roots caused by construction can take a couple or more years to manifest, often surprising a property owner when the tree dies later. We deserve trees in our yards. That’s the way it ought to be. At the same time we must compensate them in ways meant to overcome the unnaturalness. A younger tree – like a younger human body – can withstand extraordinary levels of stress but the older, larger ones can’t and are prematurely dying off. There’s no replacing them. 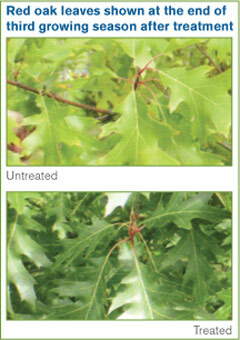 Treatment with paclobutrazol should over a period of a few years make a tree noticeably and considerably healthier. It is one of those breakthroughs that come along only so often. Research is continually emerging demonstrating its benefits. Treatment lasts three years. Cambistat or ShortStop should be applied before your tree shows symptoms of Urban Tree Decline, and is beneficial for any tree in mild decline. Remember, a tree is only as healthy as its root system. Cambistat treatment for trees in mild decline. Click the photo to enlarge. Research has shown Cambistat increases fine root density. Click the photo to enlarge.